AMPdj Trade Tips - Help Me! When a client enquires with you via email or phone, they often don’t know what to ask. For many, it’s the first time they have been entrusted with this task. For some, the only thing they can think of is, ‘How much is it for a disco for my party?’ It doesn’t necessarily mean they are price hunting. What it often translates to is: ‘HELP ME!’. Next time you receive an enquiry asking how much, or what’s your cost, don’t answer the question straightaway. Instead, concentrate on the acronym ‘HELP ME’. Take each letter and use it to HELP you to HELP the client; the best way, by far, of converting that enquiry into a confirmed booking. Helpful. Clients will look favourably on someone who is helpful. You can be helpful in many ways such as offering ideas, putting them in touch with other suppliers or by offering to do something that takes the pressure off them. The H isn’t just for getting the gig but also when you’re there. Being helpful to the guests, other suppliers and venue staff does get noticed and puts you in a favourable light with everyone which equals more referrals. Expert. Be an expert in your field. Clients will have more confidence in their DJ if they sound knowledgeable and offer ideas and solutions that the client hasn’t thought of. Another way of demonstrating you are an expert is by using stories of past events that demonstrate the point you are talking about. If you are familiar with their chosen venue, offer advice based on having worked there before. Listen/Look (depending on whether it is a telephone conversation or an email). To be able to tell the client what you can do to make a great party, you need to know what they have in mind and a little about their guests too. If on the phone, guide them into talking about themselves and their plans, then listen and take notes. This way, what you say will be relevant to them and keep them engaged. If responding to an email take note of the type of event they are holding (i.e. tailor your reply specifically to the event they are having - you don't need to tell them that you do other kinds of events). Also take note of any comments they have made and address these in your reply. Personable. definition: "If you're personable, you're friendly and get along well with other people. Being personable is part of what makes you the star of the sales team”. The old adage applies; people buy people. If a client likes you then they are much more likely to choose you as their DJ. This can easily be applied to emails, although it takes a lot more thinking about to come over as friendly with the written word than it does on the telephone. The first, most important, ‘personable’ encounter is when you answer the telephone. Is your greeting friendly and inviting? This is the part where you think about your Unique Selling Point (USP) as a DJ. What makes you stand out from the crowd? What do you do that is different to your competitors? What do clients comment on when they send you a ‘Thank You’ card, email or letter? This is a very important part of the process. If all the DJs that the client contacts sound much the same with similar services, then he/she will probably choose on price alone. If you explain to them what you do differently, or what you do particularly well, you will soon be a '60 watt light bulb' amongst the '40 watters' and your service will shine! The contents of this Infomail are ©AMPdj 2015. It can be reproduced in whole or in part elsewhere provided a clear link to the original (i.e. this page) is included. If you would like to join our 8,000+ subscribers and be included on our mailing list to receive these free Infomails (or be removed) click the link Subscribe/Unsubscribe above. 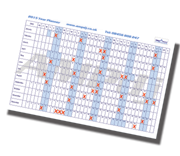 Free Year Planners, Party Planners, Sample Forms and Risk Assessments are available to all AMPdj members from the login area at www.ampdj.co.uk. Other benefits of membership are listed below. Scottish DJs can also join the Facebook group and keep up-to-date. • All inclusive at £49! "Help others achieve their dreams and you will achieve yours"